ANNVILLE, Pa. - Flagship station WMSS 91.1-FM in Middletown and affiliate station WWSM 1510-AM in Lebanon County will once again broadcast a full slate of Lebanon Valley College football in 2014. All games will be streamed live online at WMSSFM.com and GoDutchmen.com, and via theTuneIn app on iOS, Android, and Blackberry devices. The award-winning broadcast team of John Wilsbach, Brian Keyser, and Steve Leedy return for the ninth consecutive year to call all the action as the Flying Dutchmen aim for their second straight Middle Atlantic Conference championship. All but the Oct. 25 game vs. Wilkes will be heard on both WMSS and WWSM; that game will be on WWSM and online exclusively. 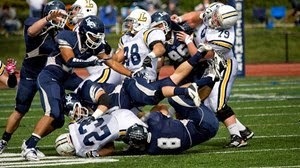 All home broadcasts will also be simulcast on LVCtv, the official video streaming home of LVC athletics. 9/6 at Franklin & Marshall 91.1 FM / 1510 AM 1 p.m.
9/13 Widener 91.1 FM / 1510 AM / LVCtv 1 p.m.
9/20 at Stevenson 91.1 FM / 1510 AM 1 p.m.
9/27 Delaware Valley 91.1 FM / 1510 AM / LVCtv 1 p.m.
10/4 at King's 91.1 FM / 1510 AM 1 p.m.
10/11 Misericordia 91.1 FM / 1510 AM / LVCtv 1 p.m.
10/25 Wilkes 1510 AM / LVCtv 1 p.m.
11/1 at FDU-Florham 91.1 FM / 1510 AM 1 p.m.
11/8 at Lycoming 91.1 FM / 1510 AM 1 p.m.
11/15 Albright 91.1 FM / 1510 AM / LVCtv 1 p.m.